LOVE that second one of the girl in blue pants. Don't know why - it just captures a beautiful creature quite well. 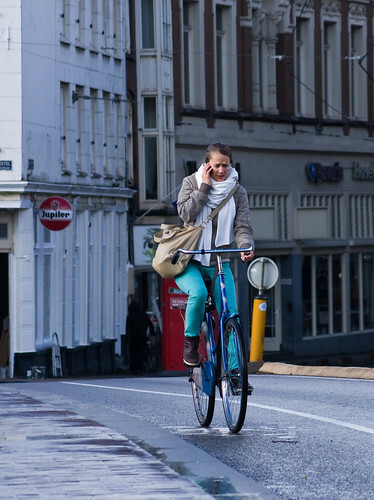 Isn't it dangerous talking on your cell phone while riding your bike? cycling isn't dangerous and there is no statistical evidence to suggest that it is. these people - whether in Copenhagen or Amsterdam - have been using their bicycles every day for their entire lives. They're rather well-trained. Besides... if it was dangerous, or difficult, they probably wouldn't be doing it. Homo sapiens are quite good at personal risk assessment. @ttv They don't. However: It is not enforced very often and - to my knowledge - only in cases very the bicyclist as shown an otherwise reckless behaviour. Apt title for two days after elections here in the States. I'm expecting all human powered transportation funds will dissapear for the next eight years. We'll just keep building those SUV's and pumping that neverending petrol. I agree with the first part of your answer above, as the statistics bear that out. BUT... you are wrong about the second part! Personal risk assessment by motorists (who as far as I know are inevitably specimens of H. sapiens) leads to an appalling casualty toll wherever these things are driven. "I'm not too tired to drive.." In memoriam someone. "I can deal with that extra drink" Yet another life turned into a mangled corpse. "I can juggle things! I can talk on my cell phone/text while I'm driving – I can see what's going on around me!" Another pedestrian/cyclist pays the capital penalty for "coming out of nowhere". 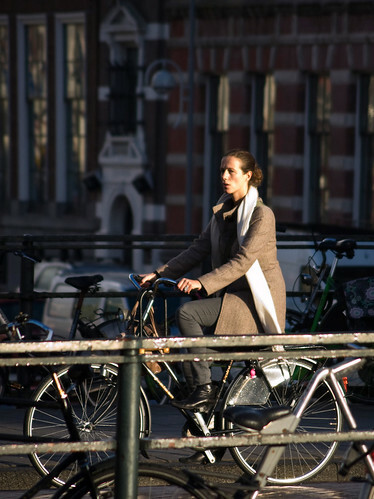 The difference is that bikes are slower and lighter than automobiles, and cyclists are more in touch with their surroundings not being isolated from them inside a glass and metal box, and are far less likely to cause the kind of damage to themselves and others that motorists do almost as a matter of course.